Suzani Textiles and Embroideries are specific styles of antique embroidered textiles produced in Kazakhstan, Tajikistan and Uzbekistan. They are embroidered and then multiple pieces are stitched together. The stitches used are primarily buttonhole, chain and stain. Usually the motifs used are the botah motif and other flowers such as tulips, wild hyacinths and pomegranate blossoms. Suzani derives from the Persian word for needle and to the coverings and embroidered hangings. 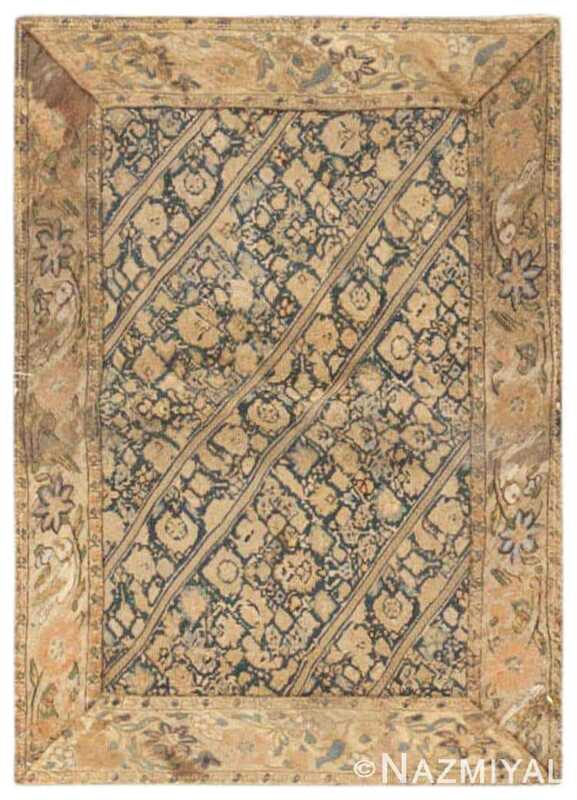 These embroideries and textiles remain popular with collectors of antique rugs, who prize such pieces for their rich cultural authenticity. While there is a wide range in styles that might appear in Suzani textiles and embroideries, popular designs tend to incorporate bright floral elements, presented in a traditional manner. The idiosyncratic designs and slight irregularities that frequently appear in Suzani textiles give these pieces a unique level of character, infusing them with an almost modern quality, making them extremely versatile and well-suited for both traditional and modern interiors. 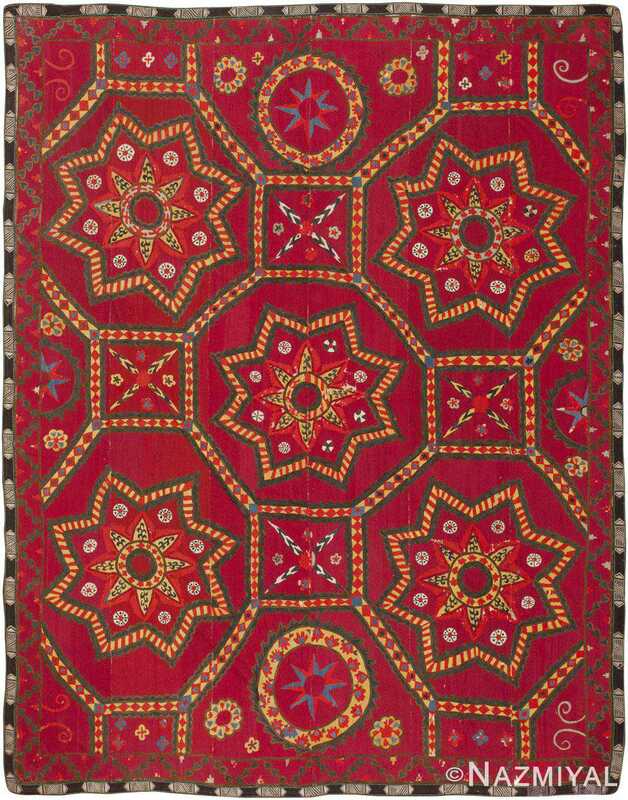 Popular in many Central Asian countries is the Suzanis – a decoratively woven and embroidered tribal textile. The word Suzani originated from the Persian word suzan for needle and the art of needlework in Iran called suzandoz. The oldest surviving Suzanis date back to the late 18th and early 19th century. However, earlier reports from the 15th century by a Castilian ambassador named Ruy Gonzales de Clavijo described embroideries strikingly similar to today’s version of the Suzani. Today’s Suzani embroideries are often made from a base of cotton or silk thread, then stitched together with another overlaying layer of the same fabric. The process of laying and fastening together several fabrics is called couching. 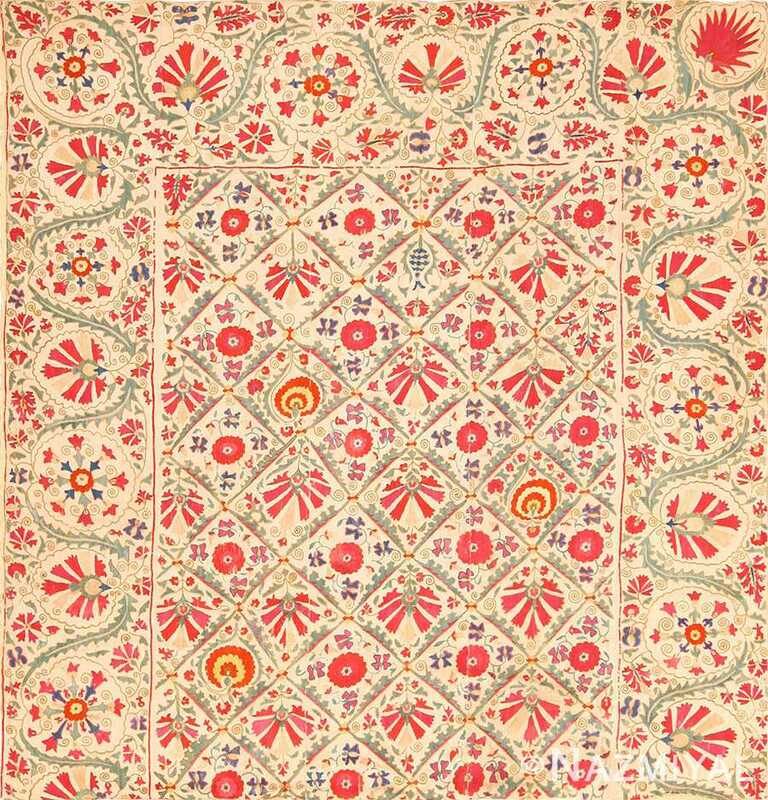 The popular methods of stitching Suzani textiles together are chain, satin, and buttonhole stitching. 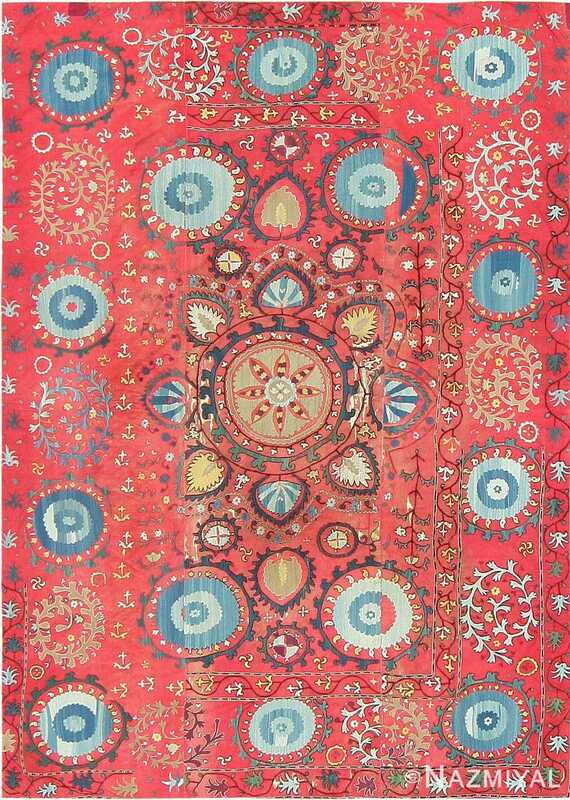 Varying, intricate designs and vibrant colors are characteristics of the Suzani. 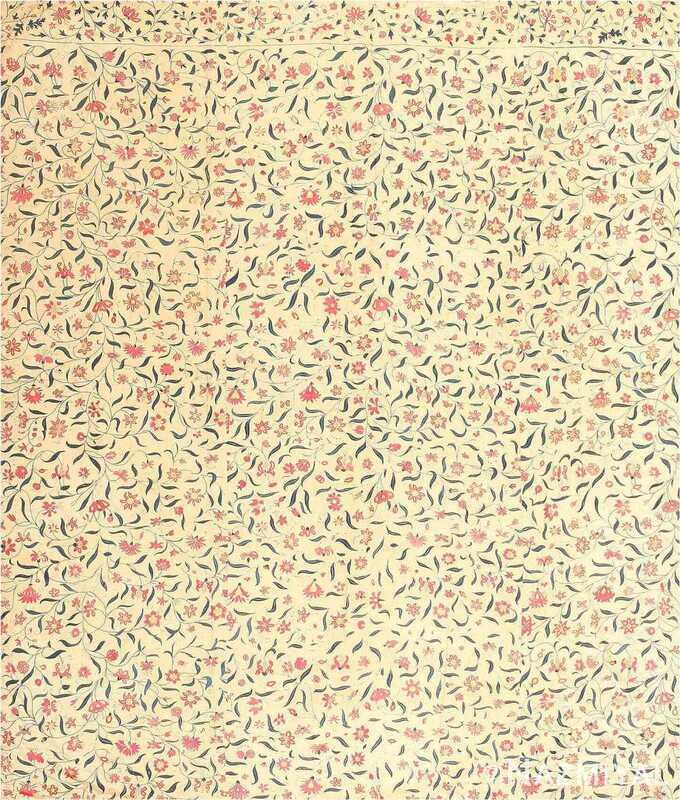 Some common themes among many Suzani designs are the Sun and Moon, flowers, fruits, fish, and birds. Traditionally, the Suzani was crafted by brides to be as part of their dowry and to show devotion to their grooms on their wedding day. It is believed that these hand embroidered Suzani textiles are imbued with a unique sense of character that can only be achieved through everyday use. The Suzani a bride made for her husband could have been traded to a traveling merchant for money or much needed household goods when times got tough. There is believed to be a story woven into every Suzani as vivid as their colors and as ornate as the designs stitched onto their surface. A monumental work, this embroidery, which measures 13 by 26 feet, is possessed by a graceful and elegant beauty, from incredible detail work to a compelling composition. 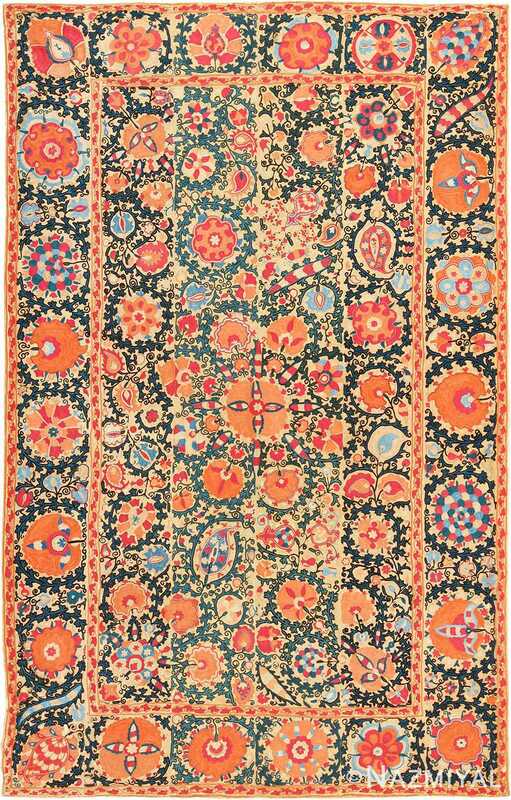 This kaleidoscopic antique Uzbeki Suzani showcases a superficial series of graphic patterns that are heavily embellished with decorative motifs and minute patterns. 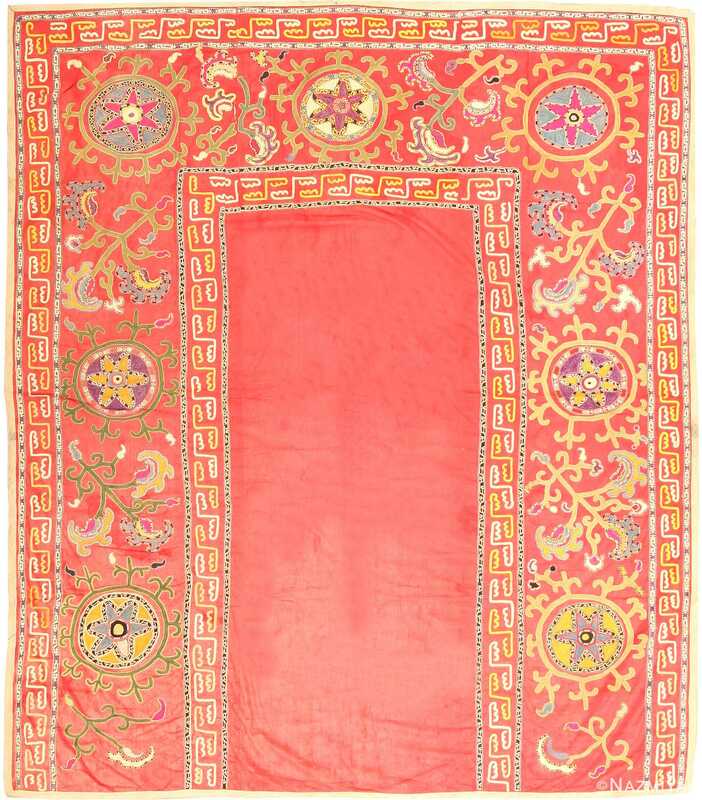 This splendid Suzani rug features an elegant all-over pattern of meandering vinescrolls with cerise lilies, carnations and other classic flowers. Drawn in a fluid style, this exquisite antique suzani depicts a variety of repeating medallions embellished with grand pointed stars and graceful botanical sprigs.